This session should be done as soon as Mom and baby are ready to venture out of the house! Included are poses of baby alone, baby with Mom, Dad, siblings, grandparents, and the entire family together! Dramatic and creative poses combined with this exciting new family moment results in great portraits. A LifeSlice media show will be available for you to share online with family, or on TV and computer at home. This popular program includes four LifeSlice sessions, 3 months apart. Enjoy LifeSlice shows from each session, plus save on our discounted Step by Step prices! Knox Studios has developed something very special for children. Most studios offer only a selection of proofs from which parents choose a couple of favorites for their portrait order, leaving the other poses lost forever in a somewhat frustrating experience. We created our LifeSlice program, where all of the wonderful images from your session are included in a moving media show available for purchase along with your portraits. You will have all of the images to enjoy forever in this show! It is also a great way to share your portraits with family and friends online. 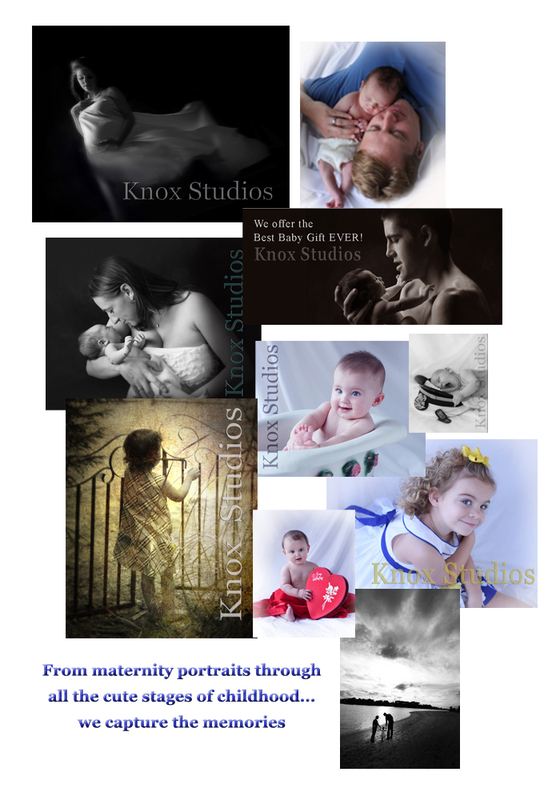 You get so much more with Knox Studios!